Editor’s Note: We welcome Gevon Servo to the Photofocus team. Gevon is a corporate photographer for a major transportation company, lover of coffee and Photowandering. He takes real-world situations through his corporate work and offers actionable advice through the content you see here. In what seems like an eternity ago, a Kickstarter started. It was for the “digiFilm camera by ‘Yashica'” and it was ‘supposed to have a soul of a film camera’ with some digital help. I, along with a LOT of other people, was drawn to it like a moth to the flame. And, as the moth no doubt discovered there was a bit of pain in the end. 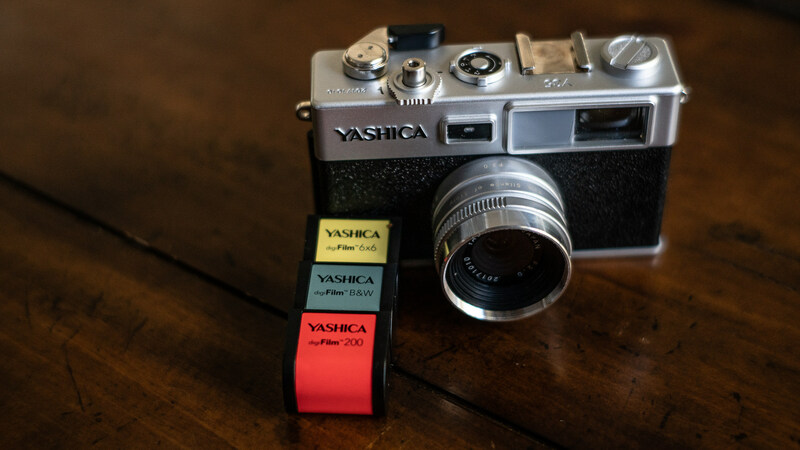 The Yashica y35 was a modeled after old Yashica film cameras from the middle of last century. Instead of having film, it would have a film-like canister which dictated how the camera would create images. There was no LCD. To take another picture the winder had to be used to “advance the film” to the next frame. Instead of being stored on film, the photo was to be stored to a memory card. At least that’s how it was sold on Kickstarter. I pledged my $162.00 to the Kickstarter, honestly not expecting too much. At that price, I could have found a found a film camera. But all I really wanted was the feel of a film camera without the cost of buying and developing the film. The only other similar camera, to me, was a Leica M-D (Typ 262) that cost as much a small car. Many respected photographers gave warnings but the Kickstarter was successful and there was a large group of people waiting. And waiting. It was a long wait. As fear began to creep in and people thought the camera would be vaporware and their money would be lost, the camera actually arrived. To the horror of many and the surprise of few, the camera was a Piece of S**t! The camera was delivered in a nice package which gave me a small bit of hope after seeing the initial horrible reviews. It turned out to work as the advertised however the Yashica y35 was built with the cheapest plastic materials possible. It was like ordering a steak and French fries and having a raw hotdog complete with soggy, stale chips brought out on a really nice plate. The camera functions horribly. The electronic connectors are slow. When I first got the camera, following the instructions, I tried to take a pic. I thought I actually did. At first nothing happened when I got the chip back to the computer. After some more experimentation with the camera, I realized I had to hold the shutter until I got the proper notification the picture was taken. That was a frustrating moment. The Yashica y35 took forever to create an image. I did manage to get a few frames out of the camera. The files were a surprisingly decent size, enough pixels to manipulate if I wanted to. The crazy thing about the Yashica y35 is, I did get that film feeling I’ve been missing so badly. I had no idea what my images would look like till I viewed them at home. In reality, that is what I was looking for. I had very little control over how an image was created. I knew that would be the case. The images created with the Yashica y35 varied in quality. The 6×6 digiFim Canister created an oddly yellowish file. The digiFilm B&W canister produced a file with the blue tint. The digiFilm 1600 and 200 were the most normal of the canisters I received with the Yashica y35. I knew backing the Yashica y35 on Kickstarter would be a gamble. This camera disappointed not only me, it did for a lot of other people too. After all the hate and vitriol, I honestly, believe the Yashica y35 was a fantastic idea, executed horribly. The images that the Yashica y35 produced were not the best, but artistic. In time, for me, the camera may prove to be an interesting challenge. I will use the camera again and see what I can make with it. Since I own it I might as well. Having a good digital camera that delivers a film feel without breaking the bank would be fantastic if a manufacturer could get it right. Until then, this is as close as I can get. This is an awesome idea! It’s a shame that the camera is not of better quality. I think that film canister thing is an interesting idea. Not having an LCD would be nice as well. It would give it more of that film camera feeling. I have an old Yashica rangefinder film camera. Likely one that this camera was modeled after. I like playing with it once in a while. I would like to use more film but yes the processing is a pain. I still have my darkroom equipment but currently don’t have a suitable place to use it. Hopefully someone will take this idea and improve it. I backed this camera. Whoever designed it is not a photographer. The shutter lag is completely unforgiveable, and renders the camera useless.